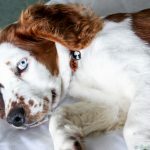 One of my biggest concerns about getting a dog was how would we still get away, my husband and I like to travel, we like to just hit the road and check into a hotel and explore a new part of the UK, as well as getting abroad, and apparently there are a whole host of hotels out there that are dog-friendly, who knew, but I’m so pleased that we discovered Ravenstone Manor, as it isn’t just dog-friendly, its dog loving. Husband and wife duo Martin and Ivana were the loveliest, they really dotted on Falcon, he loved it, and it was so nice that we could literally take him anywhere in the hotel, except the kitchen and he wasn’t allowed on the lovely sofas in the living room, but he could go in the restaurant, bar and games room, and could even sit beside us while we relaxed in the lounge area. The dog hospitality didn’t stop there they also organised Falcon his very own pet bed, bowl, towel and treats ready in our room when we checked in. My husband found the hotel through the Pet Concierge service at PetsPyjamas, they suggested a number of places, at very short notice in the Lake District area and the Ravenstone Manor really appealed because of the charming old manor house, and the fact that it was only 20 rooms, we really do have something about boutique-sized hotels, and I think we made a great choice. As we booked through PetsPjamas they also sent Falcon a box of goodies, which was waiting on arrival, which included a travel bowl, treats, a bone chew toy, poop bags, and a cute little bandana that I can’t wait to get Falcon to show off for you guys. As we booked late there wasn’t a lot of rooms left, on the Saturday night it was a full house, so we were in a standard double, while it was a little on the small side, the view totally made up for it, we looked out across towards Bassenthwaite Lake and the surrounding hills, simply breathtaking waking up to that view each morning. Overall, we didn’t spend too much time at the hotel, the whole point about being within the Lake District is to get out and walk, explore, and recharge those batteries in beautiful surroundings, there were even some walks straight from the hotel that Falcon loved, including exploring the woods and heading down to the lake, which was only a 30 minute walk and it was so stunning heading across the countryside and Falcon got to see sheep, cows, and horses, and then got to splash in the lake as a treat. Don’t be worried about getting your dog dirty as Ravenstone Manor also has a dog wash station outside with warm water for dirty paws. One of the big advantages was that we could take down Falcon to breakfast and dinner, he loved the attention he got from the hosts as well as other guests, and he loved seeing the other dogs. I was so impressed with how he behaved, all the other dogs there were a lot older, calmer and generally slept, Falcon is only 4 months old, and even though he is on the energetic side he didn’t cause any commotion, he was so good, no barking or anything. We dined in both nights we were there, the menu isn’t huge, simple but traditional dishes using locally sourced produce, but very tasty, both my husband and I enjoyed our meals. 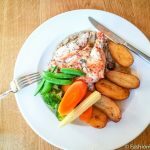 On the first night, I had fish and chips and the second-night corn fed roast chicken supreme in a wild mushroom sauce, saute potatoes and vegetables, both were excellent. High point of both meals though was the dessert, lemon cheesecake with summer berries, and sticky toffee pudding and ice-cream. 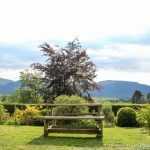 The location of the Ravenstone Manor is a big advantage, it is right next to Dodd Woods, which has excellent views over Bassenwaithe Lake and you if you are lucky you can see the ospreys fishing over the lake, its situated in the foothills of Skiddaw, and it’s only a 30-minute walk from the lake. There are lots of options literally straight out of the hotel. Want to do something other than walking, Keswick, which is apparently the most dog-friendly town in the UK is worth a visit. Derwent Water is much more commercial than Bassenwaithe and you can take a cruise around the lake, or hire a rowing boat. As the hotel is located close to the M6 and A66 you can get to lots of different places in the Lake District including one of my favourite spots Aira Force, a waterfall protected by the National Trust, close to Ullswater, another lake that I wish we had time to explore. I can’t rave enough about this fabulous hotel, the hospitality was amazing, seriously your dog will love the attention, the food is delicious, the views are amazing, the location is so convenient, and you’ll enjoy relaxing in this 19th-century manor house full of character. 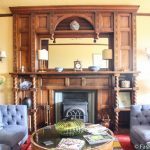 Does Ravenstone Manor and its dog-friendly approach appeal to you?